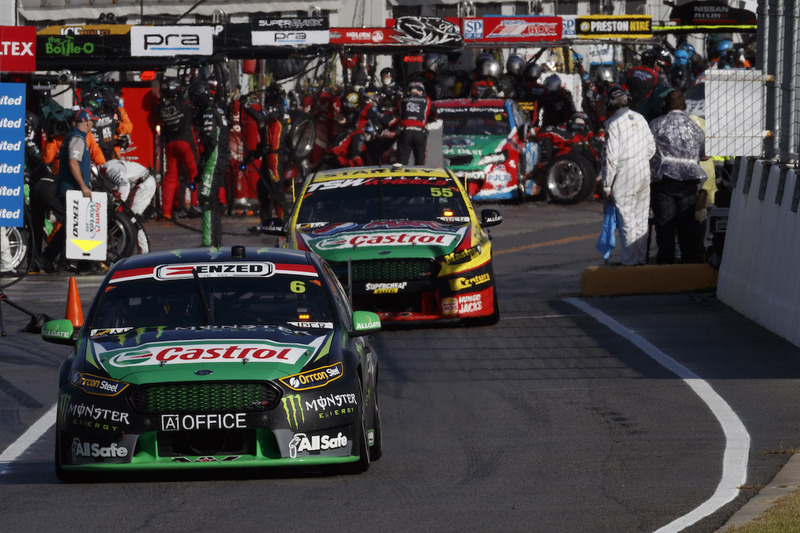 Dropping from four to three compulsory pit stops is expected to open up strategy at this month’s Wilson Security Sandown 500. Four stops have been compulsory in the Pirtek Enduro Cup opener since 2013 when the new multi-valve Nissan and Mercedes-AMG engines were struggling to match the existing Ford and Chevrolet pushrod engines for thriftiness. However, with the Mercedes-AMG M159 engine now parked and the Nissan VK56DE substantially more competitive on performance of all types, the decision has been taken to mandate only three compulsory trips through pit lane for all cars. There are no CPS changes at the Supercheap Auto Bathurst 1000 where seven stops remain mandatory. One less stop combined with the use of the Dunlop soft tyre in the 500km classic for the first time have substantially altered the ground rules for the teams. “Having the soft tyre and one less CPS should change the dynamic of the race,” predicted David Stuart, the Virgin Australia Supercars Championship sporting and technical director. “The technical department was asked by the Supercars Commission whether we could form an opinion based on our information as to whether we could drop a compulsory pit stop at Sandown,” he added. Based on known data including the fuel consumption ability of the various engines – including different versions of the same engines prepared by different tuners – on E85 and 111 litre tank fitted to all Supercars, going flat-out through an entirely green Sandown 500 and making it to the finish on three stops is not possible. “Roughly speaking, they could be as much as 20 litres short. That is a lot to save over a stint, but across 500km with safety car periods, it could be managed,” Stuart said. As a result, teams will likely require periods of economical driving during the race and also count on safety cars to fall at the right time to aid their cause. Last year there were two safety cars and they came too late in the race for the Red Bull Commodores, which ended up committing to a five-stop strategy for fuel, while the Prodrive Falcons came home 1-2 after making four stops. Reducing the number of compulsory stops also could have an impact on the number of laps co-drivers do. They usually start at Sandown and complete their mandatory one third distance before handing over to the primary driver for the final 100-plus laps. “Taking one stop out might open strategy up even more,” Stuart explained. “You are not locked in to stopping four times. “So by taking one stop out it opens up the pit stop windows and allows a little more flexibility. For instance, if you have to stop four times and there is a safety car on lap one then they would come in to get one of the stops out of the way. But Stuart made it clear that Supercars did not want to encourage the return of fuel economy racing, hence the decision to retain a CPS rule. “First off it’s expensive for teams when they lean their engines out and then it becomes an economy race and it’s not everyone having a go,” said Stuart. Commission member and Nissan Motorsport co-team owner Todd Kelly said the reduction in CPS was not a major concern. “We have gone ahead in leaps and bounds in economy since the four stops were implemented – everyone has,” said Kelly. “If we were worried about it we would have put something up to the commission, which we haven’t done. “We really need to get to Sandown and see what everyone can actually do because it’s not been probably the best indication the races we have had to date,” he said.